Bed And Breakfast236 sq. ft. Speaking of the beauty of Podere Salicotto is a difficult task, because we are not writers or poets. But we know well the emotions that this fantastic Tuscan territory gives us every day and that we put at the disposal of those who want to spend a few days in one of the most fascinating parts of Italy. Charm, quiet, colors, perfumes, art, culture; the fauna with roe deer, badgers, birds, porcupines, foxes and wild boars, the sunset that lights up the old bricks and a breathtaking starry sky. A unique show that is renewed every day. We discovered Podere Salicotto on a late summer afternoon of 13 years ago and - to say it with a joke by John Belushi in the film The Blues Brothers "we saw the light": it was the right place to realize the dream of a lifetime, open our small and cozy Bed and Breakfast. Here we decided to put our roots and open our home to travelers from all over the world. We are in the heart of the Crete Senesi, 27 km south of Siena, 2 km from Buonconvento, a small medieval village with a train station that allows you to reach the north (Florence, Milan) or the center / south (Rome, Naples) comfortably. The position is strategic. For us hospitality is a philosophy of life, made of care, simple gestures. The meeting is a mutual enrichment; in each of our guests we see a part of us. Every morning, for those who decide to spend a few nights at Podere Salicotto, it will be a sweet and delicate awakening. Breakfast is served in our garden, under the pergola, from 9:00 to 10:30 every day. Guests have a fridge for an aperitif at sunset and the lounge for pleasant readings. Welcome to Podere Salicotto, a special place. P. S. Attention, it can be addictive. 1 Free WiFi access in public areas, suites and rooms! 2 Rich and genuine breakfast, sweet and salty, every morning! 3 Served alone in the cellar, we trust! 6 The place is strategic, between Montalcino and Pienza: if you do not want to drive, in Buonconvento (2 km of excellent road) you will find the station. 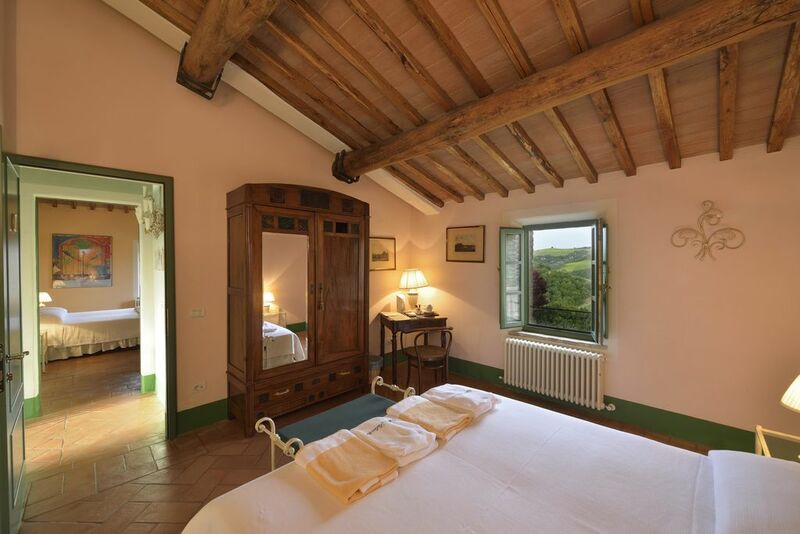 The rooms and the Suite are bright and welcoming with a magnificent view of the Sienese hills. For breakfast, sweet and savory, we are pleased to welcome you in our garden, under the pergola, from 9:00 to 10:30: a real specialty, pecorino and ham from small local producers, bread and homemade cakes, organic jams ….Good morning starts in the morning! With an eye to the east, you can caress with your eyes an evocative landscape that conveys strong emotions with those magnificent plays of light at dawn. You are immersed in the center of the universe and the mind begins to dream. The name is a tribute to Silvia's mother, Ritina, an extraordinary person for her sweetness and tenacity in dealing with even the most difficult moments with an open smile and a generous heart. SLOW TRAVEL We will be happy to share with you all that we have learned over the years about this wonderful area that continues to enchant us every day. We have selected the best experiences to experience the most authentic Tuscany. Many ideas and advice outside the traditional circuits, between Crete Senesi and Val d’Orcia up to the sea. We are at your disposal to offer you suggestions for a unique experience every day. For us, hospitality is not just a service, it is a philosophy of life. A few meters from us there is a riding school, the spas are nearby (Bagno Vignoni and Rapolano Terme), balloon flights depart from Montisi, bicycles can be delivered to Salicotto, electric, road or mountain bikes. The place is strategic, between Montalcino and Pienza. The nearest village is Buonconvento (2 km of excellent road) where there are numerous restaurants, a supermarket and the train station.